In this Nov. 13, 2017, file photo, South Korea's President Moon Jae-In delivers a statement during the 19th Association of Southeast Asian Nations ASEAN Republic of Korea Summit in Manila, Philippines. 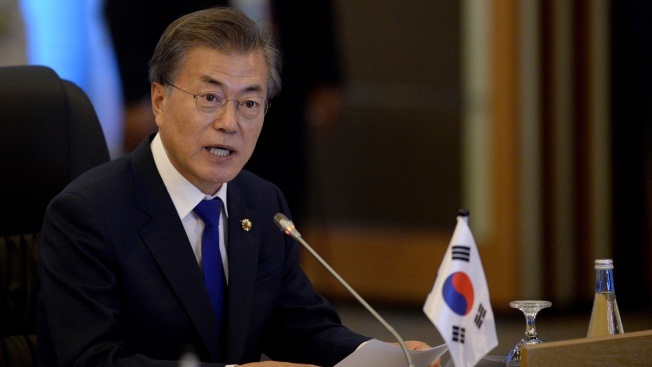 Moon said that many "critical moments" still lie ahead to end the nuclear crisis despite North Korea’s recent outreach to Seoul and Washington. South Korea's president said Thursday that many "critical moments" still lie ahead to end the nuclear crisis despite North Korea's recent outreach to Seoul and Washington. Moon Jae-in spoke before two senior Seoul officials left for the United States to brief officials about the outcome of their recent visit to North Korea. And U.S. Secretary of State Rex Tillerson said there are "potentially positive symbols" coming from North Korea but that "we're a long ways from negotiations." The Seoul officials said North Korea offered talks with the United States over normalizing ties and denuclearization of the Korean Peninsula. Seoul said the North also agreed to suspend nuclear and missile tests during such future talks. Some experts question how sincere North Korea is about its reported offers, citing what they call its track record of using past disarmament talks to wrest aid and concessions while covertly continuing its bomb program. According to the South Korean officials, North Korea said it has no reason to possess nuclear weapons as long as military threats against the country are removed and its security is guaranteed. That's the same positon North Korea has long maintained to justify its nuclear program or call for the withdrawal of 28,500 U.S. troops and a halt to annual U.S.-South Korean military drills as a condition for scrapping its nuclear program. The North sees the allies' drills as an invasion rehearsal. "We've overcome one critical moment. But there are many critical moments that we still have to go through before reaching the denuclearization of the Korean Peninsula and a permanent peace," Moon said in a meeting with church leaders. Moon still described the outcome of his envoys' North Korea trip "a big step toward denuclearization of the Korean Peninsula" that was possible with "a strong support" by the U.S. government. It's unclear whether the United States would accept the North's reported offer for talks. President Donald Trump expressed both hope and skepticism, calling the North's move "possible progress" that also "may be false hope." South Korea is keeping the U.S. informed about its discussions with North Korea and that the U.S. is providing South Korea with input as well. The U.S. must be "very clear-eyed" and realistic, he said. There should be "talks about talks" before negotiations, and doesn't yet know if the conditions are right for negotiations over the North's nuclear program. Seoul and Washington plan to kick off their delayed springtime drills next month, and how sensitively the North reacts will affect the reconciliation mood revived by the North's participation in last month's Winter Olympics held in the South. The North responded to past joint drills by the allies with its own weapons tests and fiery rhetoric. Japanese Prime Minister Shinzo Abe said Japan's policy of pressuring North Korea does not change just because its leadership is now open to dialogue. "We should not ease our stance, for instance relax sanctions, just because North Korea agreed to have a dialogue," Abe told a parliamentary session. "We should not give North Korea a reward in exchange for a dialogue." China, the North's most important ally, encouraged follow-up measures while noting the progress was in part due to the suspension of both North Korean nuclear tests and U.S.-South Korean military exercises during the Olympics. "This proves that China's proposal of suspension for suspension was the right prescription for the problem and created basic conditions for the improvement of inter-Korean relations," Foreign Minister Wang Yi told reporters in Beijing. Wang said Pyongyang's security concerns should be addressed in return for denuclearization. Moon and North Korean leader Kim Jong Un are to meet at a border village in late April, when the South Korea-U.S. drills would likely be still under way. If realized, the Moon-Kim meeting would mark the rivals' third-ever summit talks since their 1945 division, according to Moon's office.